How many of you remember the words to that catchy little song by the Five Man Electric Band? That was a popular song during the hey days of the protest songs, and it still gets some play to this day. I realize the song really doesn't have any specific meaning relating to signs themselves, it is more of a protest against being told what you could or couldn't do. The young people in that generation were pretty much non-conformists, and they didn't appreciate having their behaviors dictated to them by others. Signs were just a way to illustrate their message because signs, more often than not, are there to give us warnings and instruction in what not to do. However, the function of most signs on the highway is to warn us of what possible danger lies ahead, so the reading of signs is a very important function of a professional driver. The act of paying attention to all the things that are relevant to your safety and well being out here on the road is a learned behavior, and it usually develops pretty rapidly after you've gotten yourself into a couple of good binds. Signs are an excellent example of the many things that we need to be vigilant about paying attention to. Let's look at some of the reasons why paying attention to signs is of vital importance to the professional truck driver. A professional truck driver never relies too heavily upon his GPS. It is just a tool, and it is just as likely to have a bad day at precisely the wrong moment as any other electronic device that we use in our lives. Just yesterday I was leaving Connecticut coming down through New York and Pennsylvania and headed south to a destination in Alabama. I knew that I needed to get on I-287 West just ahead and my GPS starts squawking out that I need to go left on I-287 East! The highway signs clearly had my back, and they showed the way that I needed to go. There are so many directional signs out here to assist you that only a blind man could get lost on our interstate system. Reading the signs and comprehending what they say will always keep you on the right track. I remember years ago when I was actually in the sign manufacturing business there was a time when there was a popular name for directional type signs that we started hearing thrown about in the industry. They started calling them “Wayfinding Devices.” It is important to pay attention to these wayfinding devices because they will help keep you out of trouble. You will find them at shippers and receivers. They may be what helps keep you from turning into the wrong gate and getting yourself all in a terrible bind trying to back out of the employee parking area. Or they may help you find the right gate that you need to enter so that you are at the shipping and receiving area where there is ample room for 70 plus foot long vehicles to maneuver around properly. There will be signs that show you which door is yours to back into and there will be signs showing you how to properly exit the property. Signs are important, but they have no effect for good if you don't pay attention to them. 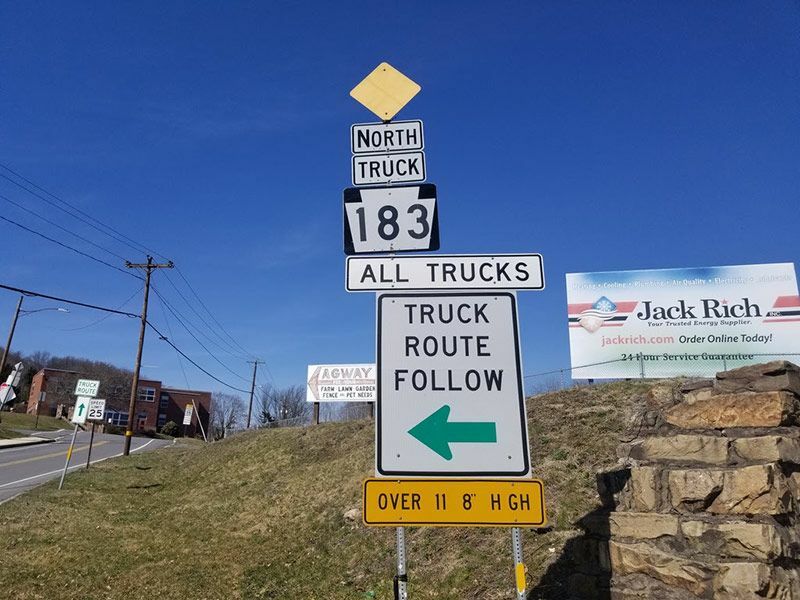 Once when I was in the Northeast running hard and heavy on a back haul load out of Pennsylvania, my attention to a sign saved me a lot of trouble. It was snowing pretty good, but the traffic was flowing nicely and I didn't have too many concerns on my mind other than rolling off the miles and getting to the truck stop, about a hundred more miles down the road, where I had planned to stop for the night. It was still daylight, but getting close to evening time when I noticed one of those electronic signs that the highway department uses to post warnings. It said, “Accident at MM 108 – All lanes of the interstate blocked.” That was about seven miles ahead of me, so I started downshifting, got off on the next exit ramp, and pulled into a truck stop to look at my Atlas for an alternate route. The truck stop was packed, and it was still early. I found a creative place to park and settled in to wait it out. It wasn't but about a half hour until the interstate became one huge parking lot of vehicles that stayed there most of that night. There were several overturned big rigs in the roadway with their freight disemboweled and spread all over the place. Those who ignored the warning signs got caught up in that terrible traffic jam. 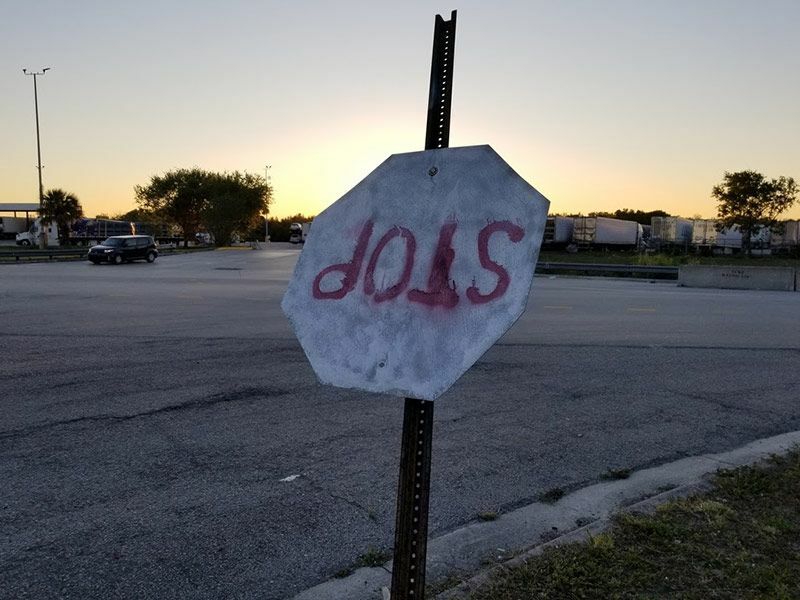 There were plenty of people who either just ignored that sign altogether, or just simply were not paying attention enough to even notice it was there. The consequences were not pleasant at all. Now, I have never had the pleasure of using one of those runaway truck ramps, but every time I am descending some challenging mountain road and see those signs telling you that there is a runaway truck ramp 1,500 feet ahead, I wonder how relieved I would feel if my brakes were smoking hot, or perhaps not working well at all. I would be really relieved to know that I had a way to escape my present trouble and get this rig stopped even if it were a really rough way to bring it to a halt. By paying attention to those signs I would know to keep my nerve and do what I can to keep my rig under control. There is some degree of relief just ahead. Those signs would be a welcome sight to a trucker who was scared out of his wits and not sure what to do but crash and burn. 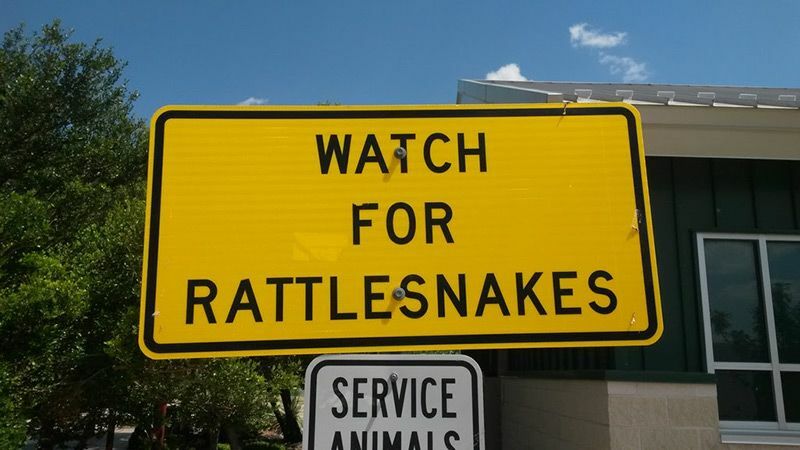 I once stopped at a rest area in West Texas to stretch my legs, but was taken aback by the first sign I saw when I exited my truck. It was a warning to watch out for Rattle Snakes in the area! I stepped gingerly across the lot into the bathroom and was still on high alert as I made my way back to the truck. I decided to take a walk and stretch my legs a little at the next stop! I remember a person at my company asking me one time about a certain low bridge that someone on our dedicated fleet had hit with his rig. He wanted to know if I was aware of it. I said, “of course.” It is a bridge that is near one of our regular customers in Louisville, Kentucky. 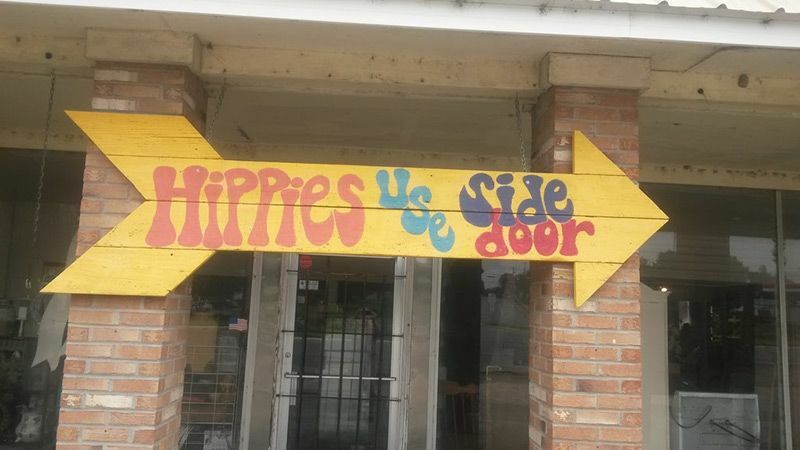 There are only about two good ways to get into that customer's location. Any other way you try to get there you will encounter a low bridge. They wanted to know my opinion on how the driver could have avoided the accident. I asked them if they had looked at the video from the dash cam yet. Their response was that they hadn't even thought of that. I told them they needed to contact safety and get them to send them the clip of the accident. 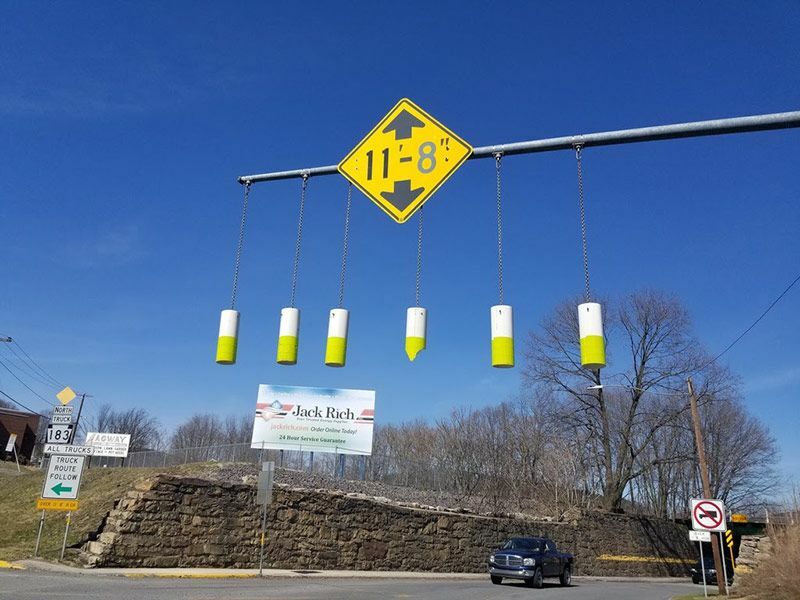 It will show you how many times that driver came into contact with a huge brightly colored caution sign with flashing yellow lights that warned them they were about to hit a low bridge. They got back to me in about a week telling me that the driver got terminated because the video showed three huge warning signs that the driver never heeded as he careened headlong into that eminent danger. He cost the company a goodly sum in repairing the truck, and he cost himself a great job, and possibly his career. All this could have been avoided had he developed good habits of paying attention and reading signs. The driver blamed it on his GPS, which was a really dumb move. Signs always trump what your GPS is telling you. This brings up another thought about this whole subject. I have yet to hear any of the autonomous vehicle advocates talking up how their product has the ability to read and comprehend signs, and then make a judgment call on how to handle whatever the situation happens to be. Does that concern anyone besides me? It is obvious what happens when a lazy driver doesn't bother to read the signs, but how much more severe will the consequences be when we have trucks with no driver ignoring the warning signs? I recently spotted three trailers sitting at one of our terminals which had all been the victims of a careless driver ignoring the warning signs about a low bridge ahead. It is such an important habit to learn to pay attention to the signs. They are there for good reasons. If all we know how to do is turn on a GPS and follow it blindly, like a lamb being led to slaughter, we are going to really do some damage to the equipment that we've been entrusted with, or worse, get ourselves seriously hurt or killed. There is a low bridge in Cressona, Pennsylvania that has I don't know how many scars on it from truck strikes. It is clearly marked and even has a hanging tin can warning system ahead of it, yet it still gets hit by trucks! There are ample warning signs ahead of that bridge, and I can't even tell you how many times I have been there in town when somebody gets themselves in a bind with that thing and has to turn around at the last minute before disaster strikes. It is just amazing that they will ignore countless warnings and then finally at the last minute decide that they better turn around. Fortunately there is enough room to turn a rig around, but you sure do end up stalling the already dense traffic in the area. Signs - Read them, pay attention to them, heed them. They can save your life.